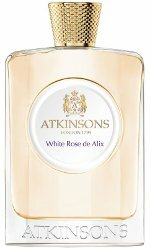 British brand Atkinsons has launched White Rose de Alix, a new fragrance in the brand's Legendary Collection. ATKINSONS is proud to revive one of the most legendary perfumes from its historical archives: the heavenly White Rose. The fragrance premiered in 1910 and became a legend as the favourite fragrance of the last Russian Empress Aleksandra Feodorovna Romanova. If it is true that a fragrance can say more about a person than his handwriting, then hardly any perfume tells a more captivating story than this one. [...] WHITE ROSE DE ALIX brings the romantic essence of its predecessor to life - but with an extremely subtle update of the ingredients. The combination of the formative radiance of White Rose with the gentle notes of raspberry and lychee exudes ethereal seductive power right from the start. A warm chypre chord of patchouli and white musk lends sensual depth and is rounded off with seductive vanilla notes. A magnificent bouquet of peony, freesia and jasmine blossoms enchants with brilliant freshness and flowery richness. Precious flower pistils of autumnal saffron lend the noble composition its smooth, warm reverberation as well as its unmistakable, golden shimmering colour! Atkinsons White Rose de Alix was developed by perfumer Julie Pluchet, and is available now at Essenza Nobile in Germany, in 100 ml Eau de Parfum.